If you didn’t grow up in an outdoorsy family — where mom and dad would load the crew into the Country Squire for a week of tent camping — the prospect of taking your own family out for a weekend of “roughing it” may seem daunting. What do I take? Where will we go? What will we do when we get there? Good questions all, and ones we hope to answer in the next few weeks as we enter the heart of the camping season. 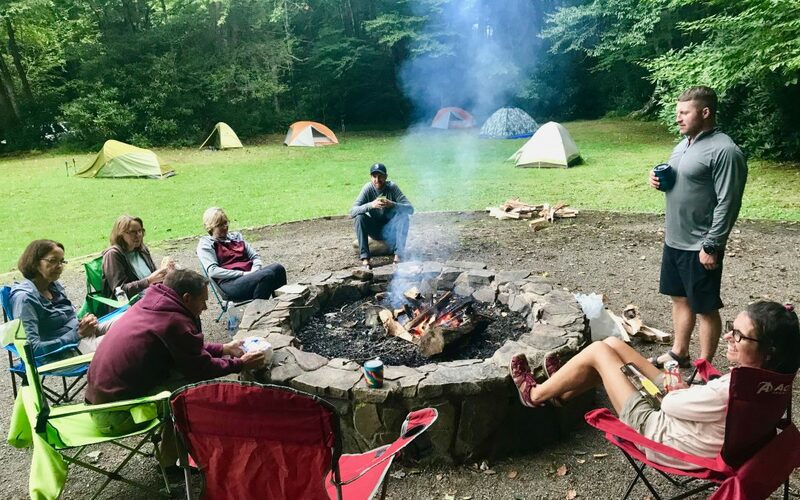 Fall, with its cool nights (ideal for sleeping), its daytime highs in the 70s (ideal for playing) and its dry air and the diminished chance of rain, is the perfect time for beginners to explore camping. 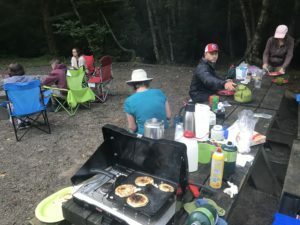 Camping is one of those rare sports that you can ease into without buying a lot of equipment, mainly because you can improvise with what you may already have. True, you will need a tent — shelter is key, and while you could string up the tarp you use to collect leaves, you’ll be happier with four “walls” to provide a modicum of privacy and protection. Beyond that, though, your initial financial investment is limited. Blankets and quilts can temporarily substitute for sleeping bags and sleeping pads (provided the overnight low doesn’t get much below 50). Your older pots and pans work well for camp cooking, while those plastic plates and the “silver” you sprung for right out of school make for dandy camp place-settings. Most campsites come equipped with a fire ring or grill; if you’re accustomed to cooking over the fire at home, you know the drill. If not, you can pick up an easy-to-use two-burner gas camp stove for less than $50. The beauty of camping is that you can eat pretty much what you eat at home — and it will taste better! If you’re an eggs-and-bacon person, you’ll be even more smitten in camp. Same for oatmeal and Pop Tarts. You’ll need a cooler, but that’s already likely in your picnic arsenal, right? Eventually, you’ll want to create a separate camp cooking kit — with seasonings, camp utensils, camp plates, etc. — but for now just pluck what you need from the kitchen. Actually, you will need to bring your leaf tarp. A tarp over your campsite picnic table provides protection from sun and rain. If you haven’t the foggiest idea of how to pitch it, fear not: as soon as your fellow campers see you struggling they’ll be over in a jiffy to lend a hand. Speaking of your fellow campers, don’t hesitate to ask them for advice. For the most part, these folks are seasoned vets — they’ve been camping for years and they’ve got it down. And a big reason they camp — in a campground, at least — is that they like people. They’re a great resource not to mention a source of new friends. Camping is one of the best ways to disconnect without actually feeling disconnected because you’re not. You’re simply connected to something other than electronics — to your family, to your friends, to yourself. If you’re intrigued and want to learn more before then, including information on guided, beginner-oriented camping trips this fall, check out the GetCamping! page at GetGoingNC.com.